A quick word beyond the usual subject here - please excuse the indulgent deviation! I have been meaning to share (but couldn't quite figure out how to fit it in) the launch of my new pet product company, Greedy Pup. Yes, pets and product design are other passions of mine! We are a functionally-oriented dog product company focused on providing effective solutions to pet and pet owner needs with great quality, value, and beautiful design. 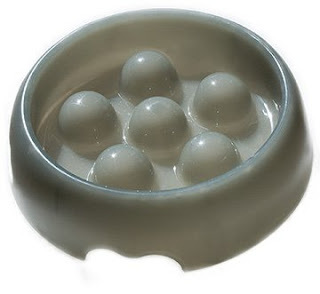 Our first product is the Eat Slow Bowl, a bowl designed to slow down the pace at which dogs eat. It provides a solution to a common concern among pet owners in a safe, gentle and effective way. Eating rapidly, and gulping air (in case you don't know) can result in issue ranging from irksome (choking, coughing, vomiting) to serious (gastric dilatation). It's a beautiful bowl that has been selling well - I am very proud of the start we have gotten. If you live in Manhattan, you can find it at some of my favorite pet stores including Beasty Feast and the Barking Zoo. If you are elsewhere, you can find it at sitstay.com (an amazing site) or our company site, greedypup.com. I hate to self promote but please keep us in mind as you think about holiday gifts for your furry friends! Thanks for the indulgence . . . Outstanding! Impressive! Unique! You did it again! Congratulations and Good Luck with your new venture! I can think of a few people who could use a bowl like this for themselves, haha. That's a very cool idea. Oh Oh!! Bailey our 6 months old is def. getting one! I am not worried about Tippy the 11 year old, he has always been a slow eater but Bailey? Heck yes!! Self promote at will such a smart product! i totally need this bowl. one of my dogs, a chow/golden mix, wolfs his food like you wouldn't believe. nothing has happened to him yet (knock on wood), but it makes me nervous EVERY time. I ordered the bowl for Grace, my granddog for Christmas. I couldn't wait to give it to her, so I sent it home when my son was here last week. He was somewhat dubious that the bowl could slow her down, but happily reported that it did. He was thrilled to discover it worked! Thanks! Would this possibly work for cats as well? One of my two cats sometimes eats so quickly that she will throw up, which I know isn't good for her. Many thanks! Thanks so much again for your purchase - I'm so glad it worked! Janet: I have heard that about cats. It most definitely should. It's a much bigger bowl than you would be used to for a cat but if you spread the food around it, it should be just as effective for a cat.